The experience of captivity was a “life within a life” for many Americans. With the primary objectives of combat removed from them, boredom, futility and helplessness became enemies to be combated as tenaciously as the Nazis. After interrogation, most prisoners would be assigned to a permanent camp based on rank, and then transported to environments that varied widely mainly based upon location and the state of the war. Americans were typically housed adjacent to, but separately from, the British and the other Allied prisoners in accommodations that ranged from wooden barracks to concrete cells with a capacity of 8 – 40 men. A meager daily ration of food was provided and was supplemented with provisions from the Red Cross, which were often communally cooked on stoves in the barracks. Attempts to prevent becoming “wire happy” included setting up classrooms and offering courses in what became known as “barbed wire universities.” Some camps contained libraries of up to 15,000 volumes (everything but spy and escape stories) and prisoners maintained a list of all of the books they read during confinement. Sporting events carried out with equipment supplied by the YMCA, such as boxing matches, track meets, football and baseball games were also very popular. Camp theaters produced shows—comedies were quite popular—and even printed tickets and playbills outlining the casts. In addition to these recreational and educational occupations, trying to escape was a way to occupy time and to feel a sense of duty fulfilled. Staying connected and alive could be a full-time pursuit. Beginning in 1943, the War Prisoners Aid of the YMCA—dedicated to the spiritual, educational, and recreational needs of POWs—supplied blank journals for inclusion in Red Cross Aid packages bound for Europe. It was reported that they sent enough journals for every American POW, although later numbers suggest that only 25,000 were printed. It is unknown how many actually made it into the hands of prisoners, or how many survived the camps, forced marches and the intervening years. Wartime Logs came with a cover letter containing the instruction to let the book be a “visible link between yourself and the folks at home.” The journals were coveted, bartered and traded. They created a precious forum in which to list frustrations and to sketch out hopes and desires. One of the primary tasks of the Red Cross is the concern for the health and well-being of prisoners of war, and among other things, they are responsible for overseeing matters of food, medicine and mail. 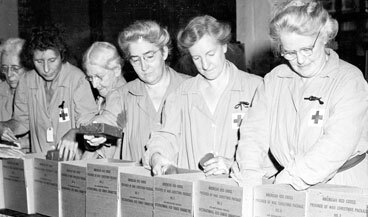 The American Red Cross played a vital role in POW life in WWII, particularly in Europe where they were permitted to distribute more than 27 million parcels to US and Allied prisoners of war. These packages were assembled in a mass effort by more than 13,000 volunteers in distribution centers around the United States. 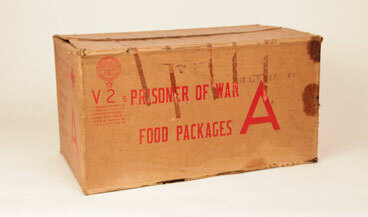 POWs were intended to receive one Red Cross parcel per week. 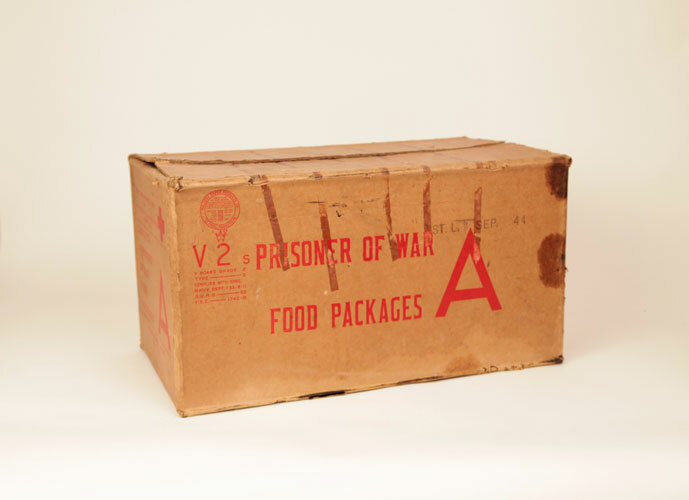 The packages, containing nonperishable foods like biscuits, raisins, coffee, powdered milk and canned beef and fish, along with amenities like cigarettes and soap, were received by American POW representatives in the camps and collected for fair and orderly disbursement. Special Christmas parcels were sent with holiday treats as well. 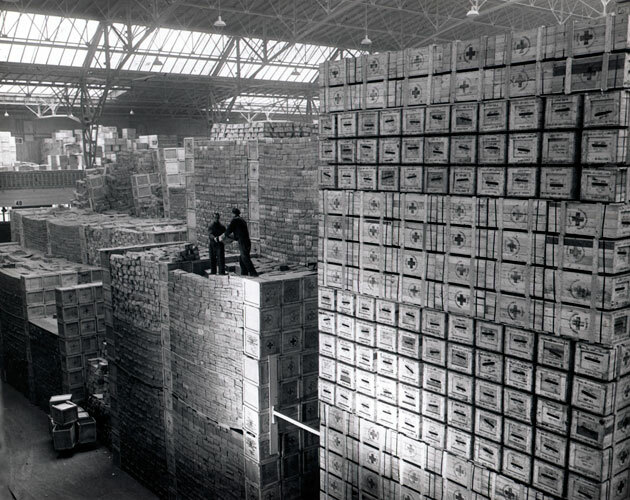 As war conditions worsened for the Germans and bombing of German supply lines increased, the receipt of aid packages dwindled. POWs captured late in the war reported very little contact from the Red Cross. 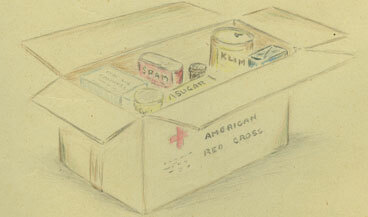 These care packages and the supplemental nourishment that they provided were a crucial part of POW survival, helping to sustain both body and soul during captivity. This box would have contained four smaller packages with amenities like cigarettes and soap, along with nonperishable foods like biscuits, raisins, coffee, powdered milk and canned beef and fish. Page from Memoirs of a Prisoner of War by George S. Vasil. 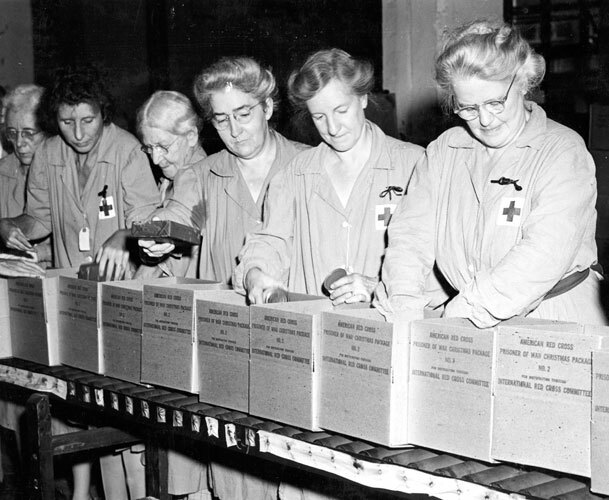 Red Cross volunteers in Philadelphia pack boxes for shipments to POWs. These packages were assembled by more than 13,000 volunteers in distribution centers around the US. 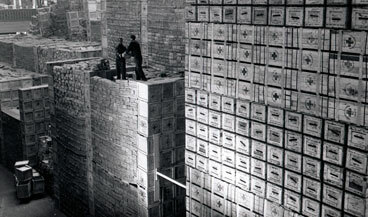 Red Cross warehouse in Switzerland from where food is distributed to POWs throughout Europe. All events are free and open to the public. For more information call 504-528-1944 x 229. Join curator Kimberly Guise as she discusses the inspiration, creation and public reception to this thought-provoking exhibition. A reception will precede the event at 5:00 pm. This 1963 film is about an escape by Allied prisoners of war from a German POW camp, starring Steve McQueen, James Garner, and Richard Attenborough. History Day Coordinator Nathan Huegen will explore the experiences of Louisiana’s WWII POW camps. Learn how the labor from these prisoners affected the state and how Louisiana residents reacted to them. This 1953 film tells the story of a group of American airmen held in a German POW camp, who come to suspect that one of their number is a traitor. Produced and directed by Billy Wilder, it starred William Holden, Don Taylor, Robert Strauss, Neville Brand, Harvey Lembeck, and Peter Graves. This film chronicles the extraordinary journey of 168 Allied airmen illegally imprisoned in the Buchenwald Concentration Camp during World War II. The story of a group of more than 300 American soldiers who were captured by the Germans during the Battle of the Bulge. Because they were either Jewish or “looked” Jewish, they were sent to concentration camps instead of POW camps, where many died. Directed by Charles Guggenheim. 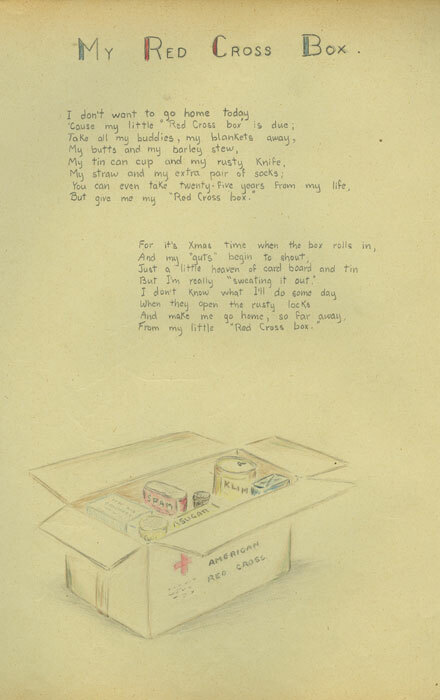 Learn more about the special diaries that the YMCA and Red Cross provided for POWs held captive by the Germans in WWII. Moderated by Robert Miller (director of the Patton Foundation and author of Hidden Hell: Discovering My Father’s POW Diary) this panel will bring together children and grandchildren of men held as POWs during WWII. Slaughterhouse-Five, or The Children’s Crusade: A Duty-Dance with Death (1969) is a satirical novel by Kurt Vonnegut about an Allied soldier called Billy Pilgrim. One of Vonnegut’s most influential and popular works. Join us for a discussion on this moving book. Director George Roy Hill faithfully renders for the screen Vonnegut’s obsessive story of soldier and POW, Billy Pilgrim. Filmmakers Mark and Christine Bonn introduce their award-winning short documentary about a POW interned deep in German territory who ran an underground newspaper from within the prison walls. The James R. Moffett Family Foundation. Special thanks to Betty B. Dettre.